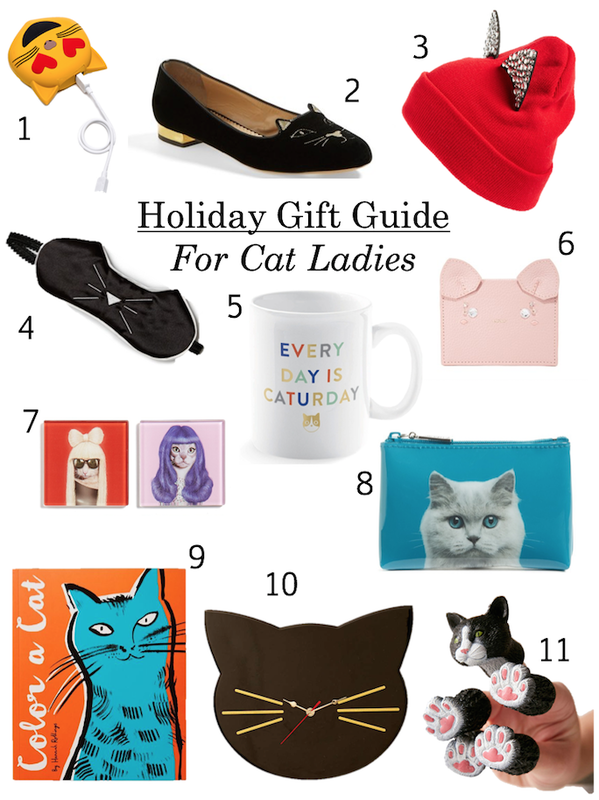 I ain't no cat lady, but that doesn't mean that I don't have a few cat lovers on my holiday gift list this year. I'm focusing on cat themed gifts for girls, because let's face it, cat guys are weird! If you do have a catty man in your life, I suggest a sassy gift like these briefs. If you're looking for the perfect gift for the cat loving lady in your life, I've rounded up some of my favorite finds from a cat face phone charger to a kitty coloring book. 1. Kitten Power Bank $40 - Power up with this smitten kitten portable charger. The portable silicone smart phone charger works for both ios and androids and is small enough to fit in a clutch for an extra charge on the go. 2. Kitty Embroidered Loafers $595 - For the luxurious cat lady (perhaps she has a persian, or three?) look no further than Charlotte Olympia's classic embroidered velvet kitty loafers. Don't miss the equally chic look for less here. 3. Cat Ear Beanie $28 - If you're shopping for an alternative cat lover or a glamour puss, this jeweled cat ear beanie will steal her heart. 4. Cat Eye Mask $20 - Don't stir the cat! For the cat lover that doesn't like the morning light, a chic cat whisker embroidered eye mask will give sweet dreams. 5. Caturday Mug $13 - If you're shopping for your cat lady colleague, look no further than a statement mug like this "Everyday is Caturday" mug. 6. Cat Card Case $85 - This playful pebble leather credit card case by Patricia Chang is offered in pretty pink or discreet black and will make her purrrr "charge it" ;). 7. Pets Rock Coasters $36 - This artistic set of six glass coasters is a great gift for cat (and dog) lovers on your list. The cats and dogs pictured are dressed to pay homage to Pop Art icons and make instant conversation pieces. 8. Cat Cosmetics Case $12 - Pretty and prissy cat lovers on your gift list will delight in a makeup bag that shows off their favorite pet. 9. Color a Cat $13 - Keep calm and color a cat with this artistic coloring book ideal for adults and children alike. 10. Cat Clock $29- Home decor is a one-size-fits-all gift and this cat shaped wall clock is a perfect gift for your crazy cat lady neighbor or Hello Kitty loving roommate. 11. Hand Cat Finger Puppet Set $8 - Kids love cats, so play along with their pet of choice with a set of silly cat finger puppets. A great gag gift or stocking stuffer!